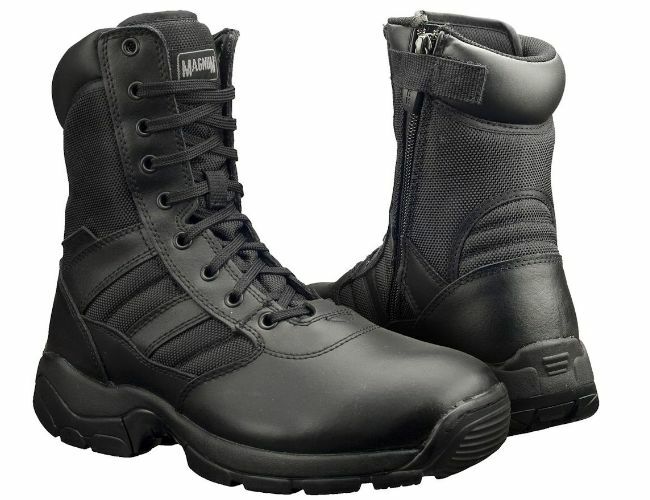 These Magnum Panther side zip boots are tough and good for patrol work. The upper section of the footwear is made from water-resistant all action leather with panels in 900 nylon.It will wick away moisture and the insoles can be changed if necessary.They come with the Magnum warranty, are super-traction with its slip-resistant sole.These boots give good protection to foot and ankle and are suitable for Police and anyone needing a good pair of outdoor boots. Magnum panther with side zip is one of magnums most popular boots. It has the lace up front to give that boot look that all magnums have. This is a super quality boot. Comes with padded tongue and water resistant leather. The passed certification EN 20347 for footwear. Padded collar and slip resistance tested. acing system for better fit adjustment. All metal 'non-glint' locking cleat . Durable lace with improved abrasion resistance. Double stitched seams with rot proof Barbour Campbell thread. Welded 'non-glint' D rings for strength and concealment - Fast wicking comfort lining ensuring your foot is kept dry and comfortable. Uniquely manufactured 'CE' approved nitrile rubber sole, offering increased rubber thickness and in-built EVA for lightweight comfort. Out sole is also heat (to 300° c), cold, slip, diesel, petrol and oil resistant. Ladder grips and a defined square heel for extra ladder safety . Energy absorption in the heel seat up to 30 joules. Removable EVA sports foot-bed for added comfort and increased suspension. Note: Also available in Steel Toe EN345-1.